Another year, another edition of ITB Berlin. This year, 45 Bidroom employees hopped on the Bidroom bus and took a trip to Berlin to attend the biggest European Travel Trade Show. More than 160 000 visitors came to see the magnificence of the show during these few days. Attendance on the show like ITB Berlin gives each and everyone from travel industry an opportunity for widening their knowledge and making new connections. What were WE doing there? Read on! This year, to mark it as a grand year for Bidroom, almost all of the employees, including the Board, attended the show. We hopped on our branded Bidroom Bus and drove from Kraków to Berlin with excitement and anticipation of what is it going to look like this year. Because of the size of the show and the amount of exhibitions and countries represented, we stroke with a full force to be able to check out as much as we can. Sales department was thriving, adding more and more hotels to Bidroom platform and making numerous deals. Marketing department making sure that not a thing goes unnoticed and widening their knowledge on inspiring panels. Finally, IT department not only learning and making contacts, but also constantly on duty to help others with any technical difficulties. The question might now arise – is that all? Of course not! Each department was busy, wandering around the show (with our calculations – making over 15 000 steps on average every day! ), joining the panels, going to the meetings and making contacts. Travel By Sound – How Does Your Destination Sound? Alexa, It’s Time For Vacation! Mapify: Turning Instagram Into Bookable Travel. Utilizing YouTube As A Distribution And Marketing Tool. Workshop: From Jerusalem food stall to the world: Food tourism goes mobile with bitemojo. Not only did we try to see as much of ITB’s attractions as possible, but we also wanted the visitors to enjoy the tastiest coffee in town before entering the Messe Berlin trade fare area. Near the entrance, there was a Bidroom-signed coffee bike that gave out free coffee for all of the ITB’s attendees. On the cup, you could get a promo code that allowed you to create and activate your account for free. Normally, the year-long subscription to the platform costs 29 euros. If you are one of the people that tried our coffee – we hope you enjoyed it! 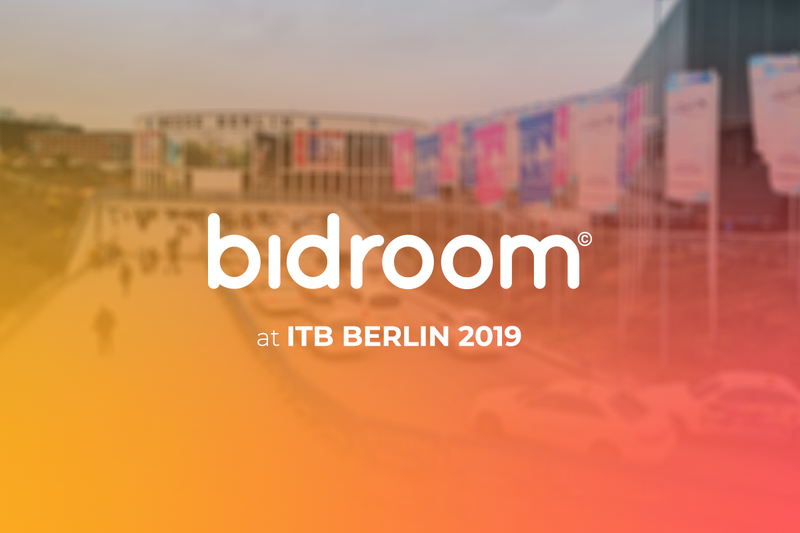 We know it is more enjoyable to have all information in one place, so we prepared an infographic with all of the numbers and details of Bidroom’s presence at ITB Berlin 2019. Hopefully, see you all next year in Berlin!